Scheduled for 10:45 a.m. Monday, Jan. 16, in the Bates College Chapel, Harley’s address is part of a celebration of King’s life and work that includes performances, workshops and a debate between Bates and Morehouse college students. All events are open to the public free of charge. For more information, call 207-786-6400, or see a complete list of scheduled events for Martin Luther King Jr. Day. “The noble road to peace is not just a matter of not having war,” says John McClendon, associate professor of African American and American cultural studies at Bates. “More importantly, peace must be joined to justice.” Chaired by McClendon, the Bates committee that organizes the annual observance of King’s birthday chose to recognize King’s ardent opposition to the Vietnam War as it damaged lives abroad and diverted resources from social ills in the United States. “At this time in history we see a very similar situation, especially after Katrina, where 30 percent of the National Guard equipment that could save lives in New Orleans was used to take lives in Iraq,” McClendon says. The college also co-sponsors an annual MLK Day Read-In where faculty, staff, students and members of the community will share a picture book with Martel School students in grades 4-6 at 1 p.m. Thursday, Jan. 19, and Friday, Jan. 20. Those interested in volunteering should e-mail Katie Seamon at this kseamon@bates.edu or call 207-786-8351. The King Day observance begins on the eve of the holiday, at 7 p.m. Sunday, Jan. 15, with a memorial service of worship in the College Chapel, College Street. The Rev. William R. Jones, Florida State University Professor Emeritus, a pathfinder in the field of African American philosophy, delivers the sermon, ” Martin Luther King’s Noble Path to Peace: Pioneers, Pedestals, and Perils,” followed with musical performances by Bates students. 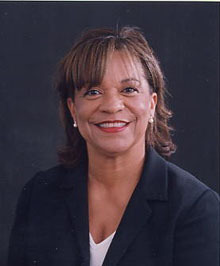 The Multicultural Center hosts an 8:30 p.m. reception with Jones after the service at 75 Franklin St. The author of Is God a White Racist? A Preamble to Black Theology, the landmark critique of the black church’s treatment of evil and the nature of suffering, Jones is an internationally recognized scholar in the fields of liberation theology, African-American religion, religious humanism and multicultural education. 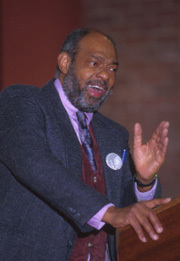 Best known for his contributions to the theory of oppression and conflict resolution, Jones has written more than 100 articles about oppression, justice, black theology, counter-violence and the role of the church in social change. Student debaters from Bates and Morehouse colleges kick off King Day itself when they argue the topic, “On the Immediate Withdrawal of Troops from Iraq: Noble Road to Peace or Accommodation to Terrorism?” The debaters will be introduced at 9 a.m. in Chase Hall Lounge, 56 Campus Ave. The debate will begin at 9:30 a.m. The match has historic resonance for the schools, which share a continuing commitment to collaborative projects. The nation’s largest liberal arts college for men, Morehouse was Martin Luther King Jr.’s alma mater. One of its longtime presidents was a 1920 Bates graduate and accomplished debater Benjamin Mays, a lifelong adviser to the great civil rights leader. Mays and the eulogized King in 1968. Professor Sharon Harley delivers her 10:45 a.m. keynote address, “Race Women, Race Man: Imagined and Real Conversations Between Louise Thompson Patterson, Gloria Richardson and Dr. Martin Luther King Jr.,” in the Bates College Chapel. “Known throughout the world for his steadfast convictions and pursuit of racial equality, King’s nearly decade-long fight in the modern civil rights movement defined his legacy as a political activist and nonviolent protester,” says Harley. Harley’s talk focuses on the work and lives of these two “race women” during the middle decades of the 20th century, and the imagined and very real conversations they (likely) had with King. “In an attempt to paint a more comprehensive mosaic of black men and women’s long and ongoing struggle for economic and racial justice in the United States,” says Harley, she will examine their activism relative to King’s. An associate professor of African American Studies, Harley teaches courses on African American history, black culture, women’s history and women and work. She is the recipient of many scholarships and fellowships, including the 2003 Woodrow Wilson Center Fellowship, the Smithsonian Postdoctoral Fellowship, the Rockefeller Fellowship for Minority Group Scholars, the American Association of University Women and the Ford Foundation. Her research has focused on the history of black wage-earning women and black women’s organizational activities in the District of Columbia. Harley received her doctorate in U.S. history from Howard University. A prolific scholar and widely published essayist, Harley is editor of and an essayist for Sister Circle: Black Women and Work (Rutgers University Press, 2002), an interdisciplinary volume exploring the role of work in black women’s lives. Her essay titled “The Death Foretold: Gloria Richardson and the Radical Black Activist Tradition” appears in Sisters in the Struggle: African American Women in the Civil Rights and Black Power Movements (New York University Press, 2001), edited by Bettye Collier-Thomas and V.P. Franklin. Harley’s major publication, Timetables of African American History: A Chronology of the Most Important People and Events in African American History (Simon & Schuster, 1995), was adopted as a selection for the History Book and Book-of-the-Month clubs. Concurrent Monday afternoon workshops hosted by various academic departments and student organizations begin at 1:15, 2:35 and 3:35 p.m. in classrooms throughout Pettengill Hall. The workshops, featuring speakers and discussion, will focus on RE-STATE THEME. Topics range from King’s spiritual roots to the relationship between African American music and utopia, from the poetry of justice from around the world to recent shifts in Lewiston’s refugee population, from diversity in the sciences to the influence of Hegel on King’s political thought and practice. For more information about the workshops, call 207-786-6400. 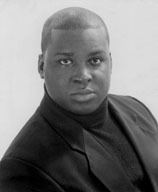 The entire King Day observance concludes with a performance and Hurricane Katrina fund-raiser at 7:30 p.m. in the Olin Arts Center Concert Hall featuring the New Orleans-based tenor Chauncey Packer, a rising young opera star who is a Ph.D. candidate at Louisiana State University. Packer offers a concert of African American sacred music.